Just had to share this recipe. Inspired by Master Chef UK this week I wanted to find and try an almond crusted rack of lamb recipe and it didn’t disappoint. Toast the mustard, fennel & cumin seeds in a pan. Grind toasted seeds in a mortal & pestle to a fine powder, then mix with the Grounds Almonds. In an oven proof dish on the stove top, in a little oil, brown the lamb rack on both sides. Remove from oven & spread the dairy free spread on top & press the almond mixture on top, place back in the oven for 2 to 4 minutes until brown. I served my Almond Crusted Lamb with a few roast potatoes, mixed vegetables and a fruit sauce. My fruit sauce was made by heating a few frozen blue berries and raspberries, until they were warmed through. 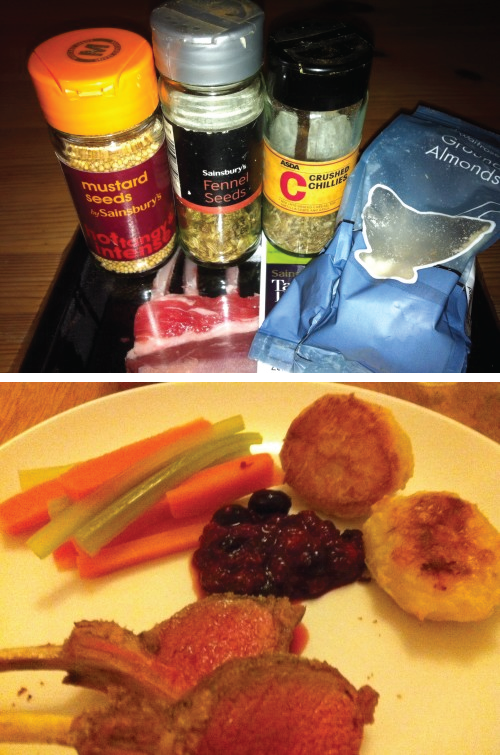 If you fancy something special for your dinner give this Almond Crusted Lamb recipe a try – delicious. Free From Pancakes Polenta - What is it?